Today I’m researching for a talk next week, on ‘Creativity in Business’. I could do something I’ve already done- but I prefer to put together something new. So I’m researching the creative icon that is Albert Einstein. I’m writing this blog mid-research- as I have had a jump out of your chair “Yes!” moment. Do you have those? Albert Einstein is famously known for the quote “Imagination is more important than knowledge” but there is so much more to his thinking on creativity. 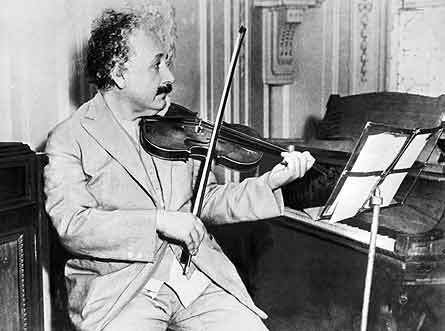 As well as a scientist Einstein was an accomplished musician he played the piano and violin. This recording of Einstein playing Mozart has only recently been discovered. Music played a significant role in his life. If he was stuck, he might play his piano and when finished, he’d often say “Now I’ve got!”. The playing of the piano not only allowed him to take his mind off ‘the problem’ but also stimulated his creativity in a wider sense. There is now evidence to suggest playing music can increase your ‘intelligence’ and brain elasticity- which is a big part of creative thinking. What was most interesting in all of this was also finding out that Einstein didn’t think in words- but in ‘images, feelings and musical architectures’. Just for a moment consider how our working practices, problem solving and decision-making are all based around words- either written or spoken. Einstein is also big on intuition and inner knowing. Whilst I’m sure no business would object to an image of Albert on their wall- would they also welcome the use of ‘intuition and inner knowing’ as part of their regular business practice? Einstein is not only an icon for creativity but also for intuition in ‘the board room’. The final nugget from my reading today Id like to share with you is this: ‘personal creativity enables professional innovation’. Wow! So why did this research cause a Yes! moment? I’m working on my own big idea at the moment, which is partly based on past experience, but largely based on intuition and inner knowing. Firstly Einstein has just given me permission for this to be more than okay- thank you. Secondly, and more significantly the subject of my big idea is relates to thinking through images. I’ve always had a strong feeling that people can have better ideas, express themselves more, be more creative and innovative if they just ditched words for a while and learned to access their own visual langauge. There’s so much richness in the ‘right brain’ and I’m going to create a space for people to explore it, at a deeper level, in a buisness context. Can you imagine the potential? Today was one of those dots on my journey as I bring this idea into the world. This entry was tagged Albert Einstein, business, creative thinking, creativity, Einstein, innovation, thinking. Bookmark the permalink. ← Where’s the play-doh Prith?